Is it right to have so much fun at the place you work? Last night was the third night of the weaving class and everyone was having a blast.... including Jerry and I... if you have been by the shop, you probably noticed the floor loom that sits in the front window and has become an extra spot to hang hanks of yarn and the bench holds the extra books that aren't fitting in the bookcase - well thats all changed now! Thanks to our wonderful weaving teacher, Carol, we are on the road to a gorgeous new shawl... so the plan is to make a 20" wide shawl - not sure of the length yet, but there is plenty of warp to probably cover two shawls. YEAH! We warped our yarn last night, a wonderful selection of Rowan Damask and Gedifra Rubens and around 11:00 PM we decided that was it for the night..... it took us a little longer than expected since we missed one heddle when threading and go figure, we missed a middle heddle... so half the threading had to be redone... it helps that both Jerry and I were threading it together. 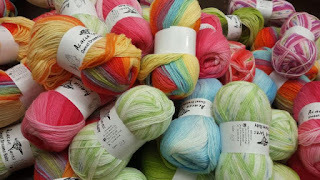 Here's a shot of how far we got... Now the big question is what to weave with... we are tossing up the idea of Katia Caribe in a creamy blend or possibly Gatsby Lux in a black, pink and gold colorway... ahh decisions decisions! Maybe both? Fun, yarn, weaving and more!